A new study found that blue light can cause macular degeneration, one of the leading causes of blindness. Blue light harms our vision by damaging the eye’s retina, the researchers say. The study found that blue light turns a molecule in the eye into a poison that kills photoreceptor cells, which do not regenerate. Special sunglasses that filter blue light might help, but specialists aren’t sure how much good they actually do. Staring at screens all day isn’t good for us – we know this. It can cause eye strain, sometimes called computer vision syndrome, and the light is so bright it can mimic sunlight, mess with our hormones, and prevent us from feeling sleepy. The team found that shining blue light on eye cells transforms vital molecules into a cell-killing poison that can lead to age-related macular degeneration, one of the biggest causes of blindness worldwide. “We are being exposed to blue light continuously, and the eye’s cornea and lens cannot block or reflect it,” Ajith Karunarathne, an assistant professor in the university’s Department of Chemistry and Biochemistry who helped write the study, said in a press release. Macular degeneration occurs when photoreceptor cells in the retina die. They do not regenerate, so “when they’re dead, they’re dead for good,” said Kasun Ratnayake, a doctoral student researcher who also wrote the study. The photoreceptor cells need molecules called retinal to sense light. But the researchers found that blue light can cause retinal to change and kill photoreceptor cells by dissolving some of their membranes. The team added retinal molecules to other body cells – like cancer cells, heart cells, and neurons – which also died when exposed to blue light. Without the retinal, blue light had no effect on the other cells, the researchers said. The researchers also found that a molecule in our eyes and body called alpha-Tocopherol, a natural antioxidant, stops affected cells from dying. But as we age or our immune system takes a hit, we lose the ability to fight against the toxic-retinal attack – and that’s when the damage occurs. Karunarathne suggested using special sunglasses that filter UV and blue light to try to combat the effects, but experts are unsure whether they do that much good. 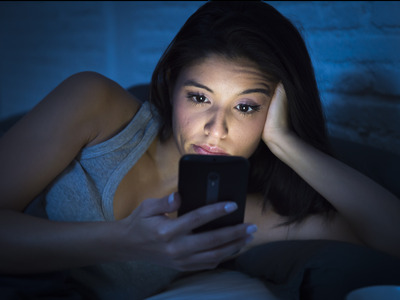 You can also try to avoid smartphones and laptops when it’s dark – something you should be doing anyway if you want to get a good night’s sleep.